On Monday, March 5, the University of Utah football team held its first spring practice at the Spence Eccles Field House. The Utes will hold 14 more practices and end their spring season with the 15th annual Red and White scrimmage game on April 14. There are a total of eight early arrivals of Utah’s 2018 recruiting class, including four defensive backs, three defensive linemen and four-star quarterback Jack Tuttle. Tuttle is named fourth best in the country out of all pro-style quarterbacks. He led Mission Hills High School in San Marcos, California, to a 12-1 overall record and threw 41 touchdowns for 3,171 yards. Whittingham is in his 25th season overall at Utah and this is the 14th annual spring camp conducted. He has a 111-56 record at the U and is tied for second among active coaches in bowl wins in the NCAA at 11-1. Liking the energy on the first day of practice, Whittingham was pleasantly surprised with how the offense’s execution, assignments and tempo was much further ahead than what it was last year. The bowl win against West Virginia in the Heart of Dallas Bowl this past December put a good taste in Utah’s mouth at the end of the season. Despite three close loses to USC, Stanford and Washington, the Utes ended with a 7-6 overall record and 3-6 in the Pac 12. Even with a good end to the season, it will be a challenge to adjust to new players in the spring. A primary player returning for the Utes is kicker Matt Gay. Gay was number one in the nation with an average of 2.25 made field goals per game and won the first Lou Groza Award for Utah. He holds a Utah single-season record with a total of 27 made field goals. 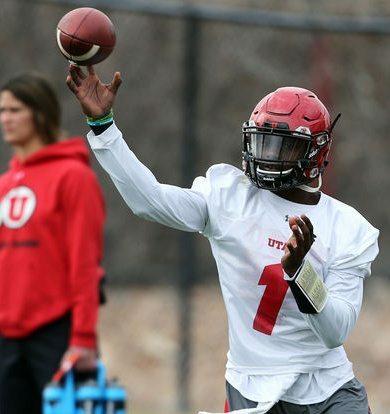 Tyler Huntley is going into his junior season as the anticipated starting quarterback for the Utes. Despite an injury halfway through the season, he threw 15 touchdowns for 2,411 yards. He wants to continue growing in the offensive system and stay consistent on a daily basis with his throws. He also hopes to get a feel for the newer faces this spring. The Utes will continue with spring practice on Thursday, March 6, on the Eccles Practice Field.